NATCHITOCHES, La., March 14, 2019 /PRNewswire/ -- Dimension Development is pleased to announce Richard Ross as Director of Sales and Marketing and Annebeth Black as Associate Director of Sales of the Grand Hyatt Nashville. Richard brings over 30 years of operations, sales, marketing, pre-opening and multi-property leadership experience to Dimension. He is relocating to Nashville from Hot Springs, VA, where he led sales, marketing, revenue and membership efforts for the renowned Omni Homestead Resort. Known for developing award-winning teams that exceed performance expectations, Richard has worked for several major brands including Omni, Hershey, Hilton and Westin and studied Hotel Management at the Conrad Hilton College/University of Houston, Houston, TX. Annebeth has a long and distinguished career in hospitality. Most recently, she served as Director of Sales and Marketing of the Embassy Suites by Hilton SE Nashville Hotel and Convention Center in Murfreesboro, TN. Prior to this position, Annebeth served as the opening Director of Sales and Marketing of the Hyatt Place and Hyatt House Denver/Downtown in Denver, CO – a first-time dual build of these two brands under one roof. Annebeth graduated from Spring Hill College in Mobile, AL, where she earned a degree in Public Relations. "We are thrilled to bring proven, top-tier talent like Richard and Annebeth to the Nashville market and to our new Grand Hyatt. Our pre-opening sales efforts are making great progress; we've received tremendous interest in this property and the team is actively booking groups from October 2020 onward," said Paul Williamson, Vice President of Sales for Dimension Development. Opening in 2020, the Grand Hyatt Nashville is inspired by Music City's history, charm and personality. The luxury, 24-story hotel features 591 beautifully modern guest rooms, a signature restaurant, multiple bars, a rooftop lounge, a pool deck overlooking downtown, a Grand Club Lounge and a world-class Spa. 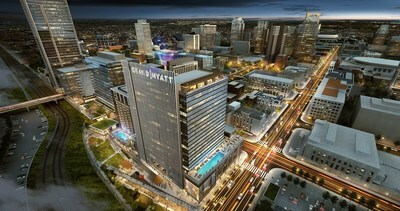 The Grand Hyatt Nashville will also offer one of the city's largest event venues. Floor-to-ceiling views will adorn 77,000 square feet of state-of-the-art event and pre-function space. Additional outdoor venues, flanked by a 1.5-acre park, will also be available for events and guests, ensuring a unique and unparalleled hotel experience in Music City. Located on Broadway at the gateway to downtown Nashville within the stunning 16-acre Nashville Yards development, the Grand Hyatt Nashville will be surrounded by shopping, restaurants, bars and entertainment. The hotel will be within walking distance to many of Nashville's most popular attractions, including the Nashville Convention Center, Country Music Hall of Fame and Bridgestone arena, among others. To learn more, visit www.grandhyattnashville.com and www.nashvilleyards.com. Dimension Development Co. was founded in 1988, and has successfully developed, acquired and managed full-service, all-suite, and limited feature hotels. The company's various hotel partnerships have produced winning combinations in markets throughout the country. Dimension is a growth-oriented hospitality management company. Its current portfolio consists of more than 65 hotels across the US with the leading brands: Marriott International, Inc., Hilton Worldwide, Hyatt Global and Resorts and InterContinental Hotel Group. For more information about Dimension Development Co., please visit www.dimdev.com.